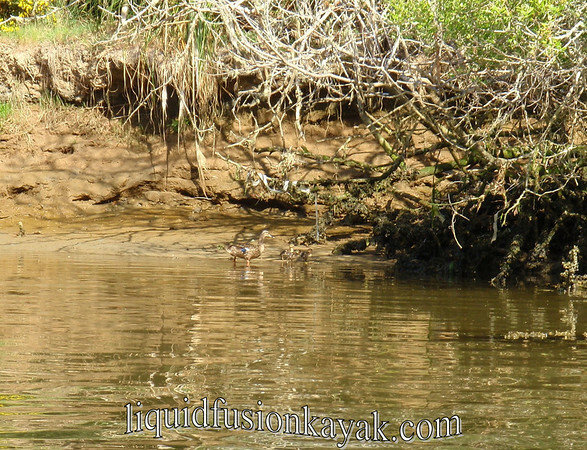 Wild spring winds have us continuing to seek sheltered paddling conditions on the quiet waters of the Noyo River. We continue to be amazed how protected it is from the wind that seems to be whipping everywhere else on the Mendocino Coast. The wildlife seem to be enjoying sunny, warm, spring days on the Noyo as well. Last weekend's paddling started off with sitings of a river otter and then continued with mallard duckli ngs, osprey diving for fish (sometimes catching one), assorted ducks (Harlequin, bufflehead, and goldeneye), herons, egrets, cormorants, and woodpeckers. 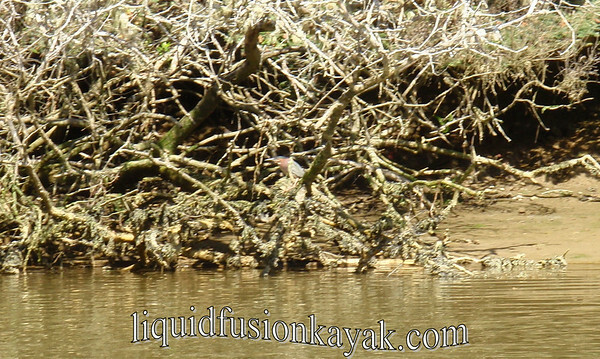 The green herons tend to be shy and elusive of our eyes on the Noyo River, but we saw 3 of them at once and then continued to see them at different points during the day. I shot a photo of my favorite harlequin duck with a bufflehead swimming behind it and behold a green heron managed to sneak into my shot as well. Sunday afternoon, Jeff and I enjoyed a peaceful paddle on a high tide up the river to the tunnel where the Skunk Train comes through the hill and makes its first crossing of the Noyo River. The water was so clear that I was constantly scanning the bottom - no abalone to scout for here but I am intrigued by river and creek bottoms and was hoping to see some fish. I commented to Jeff that one of these days we would start seeing turtles and sure enough - he spotted one on a log. Unfortunately the turtle spotted us and slipped into the water before I could get a photo. We then saw another one who appeared to be snoozing on a log just below the river's surface. Being one who dislikes the wind, I have to consider this spring's windy season a blessing because it has made us spend more time on the Noyo River and has given us more insight into the river and its wildlife. I am working on a new video of sea kayaking and the wildlife of the Noyo River that I hope to share soon.